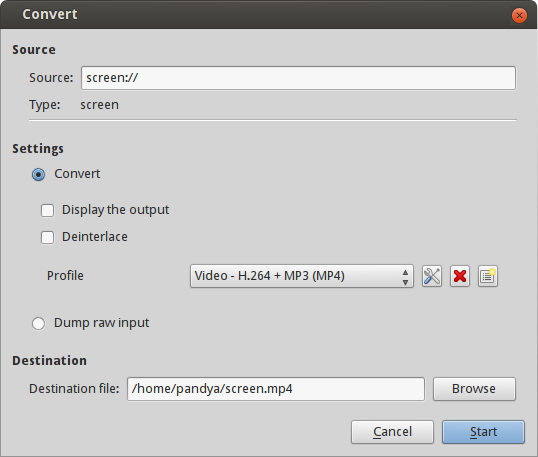 How can I record my screen on Ubuntu? 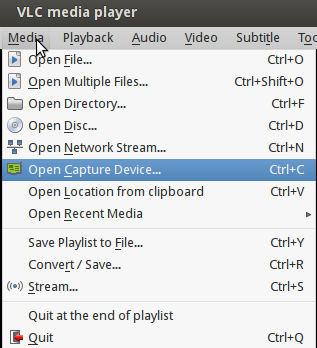 Adds an easy to use graphical icon on the GNOME toolbar to make a pleasure use and configure the audio and video capture and screencast application recordMyDesktop. I like Byzanz; it records your activity as a GIF file. It's pretty light and works well, especially for putting a shorter screencast on a webpage or in an email. It gives you a delay before recording. Recording is done in HD and the output is in .mkv format which is accepted for YouTube so there is no need to convert and re-render. 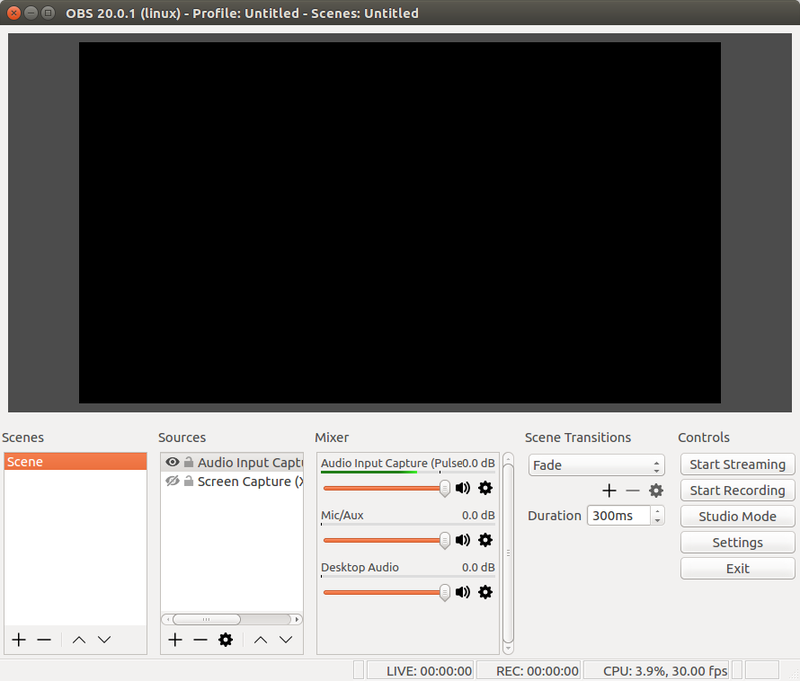 SimpleScreenRecorder is a Linux program that I've created to record programs and games. There are programs that can do this, " but I wasn't 100% happy with any of them, so I created my own "
My original goal was to create a program that was just really simple to use, but as I was writing it I started adding more and more features, and the result is actually a fairly complex program. It's 'simple' in the sense that it's easier to use than ffmpeg/avconv or VLC :). Recently I tried to record a screencast with audio. I tried many of the options listed here and other websites. My goal was not to write a comprehensive summary of all tools available, but to find a single one which works. In my case (after several hours of struggling) it was VOKOSCREEN which worked, so I did not look further. My system is Linux Mint 15 Olivia, 64-bit, which is based on Ubuntu Raring. gtk-recordmydesktop: creates ogg which is fine, but unable to convert to anything. Best converter was mencoder but is speeds up video (but not audio) so they get out of sync. Kazam: if record area larger than ~640x480 memory starts leaking, leaving at most a few minutes before system becomes unresponsive. Many have reported similar issue, this is a known bug. The delay 10 gives me 10 seconds to "prepare" my desktop before it starts recording. When I'm done I hit ctrl+c, then it starts encoding the file. I have a dual display, and the width/height argument lets me focus recording on one of my monitors. By adjusting this value I can also record onto my second monitor. Install screenkey for a slick overview for screencasts. 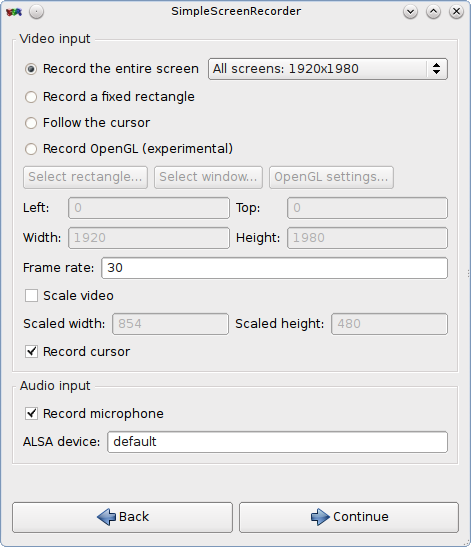 Tibesti Screencaster is a program for Ubuntu that allows you to record your screen and your microphone and/or audio out sounds. To install add the PPA ppa:ackondro/tibesti (How to add a PPA) and then install tibesti from the software center. Have a look at Wink. Download (freeware; Windows and Linux). There are two tutorial projects created in Wink which you can view. 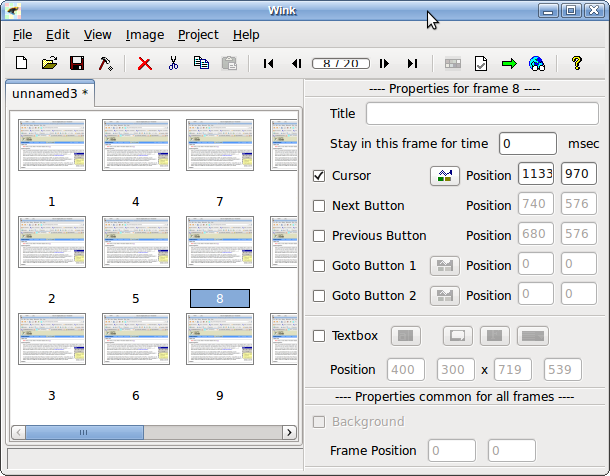 Use the Help, View tutorial menu options to render and view them before you start using Wink. The answers prior to mine have clearly answered how to create a video screencast. Now if you just want to show an animated screenshot, essentially an extremely short screencast in an image format (GIF, and not more than ~10 sec), it's also easy. You'll need Gimp, mplayer (WARNING! NOT mplayer2) and mencoder. Issue the following commands to install them. Alternatively, you can install them from the Synaptic package manager that comes with Ubuntu. Where, -ss 0:0:33 tells mplayer where you begin (0 hours, 0 minutes, 33 seconds), -endpos 2 tells mplayer where to stop (2 minutes), z=9 sets compression level for the output png images to 9, Desktop/animated is the directory (~/Desktop/animated/) where you want the images to be output to. Start Gimp > File > Open as Layers > browse to the directory (~/Desktop/animated/), Ctrl+A to select all images, and click 'Open'. Simple hit Shift+Ctrl+S or go to File > Save As... and name the image as 'animated.gif' > hit 'Save' > check 'Save as Animation' radio button > hit 'Export' > in the next window, simply hit 'Save' unless you know what you are doing. That's it. You have your animated GIF ready! But this works really well. The main reason why I use it is because I can record both my microphone AND monitor output with ease. Plus you can stream to Twitch if you'd like. If you don't want to add the PPA you can also download the deb file and installed with sudo dpkg -i <debfile>. Note: The "fake" ffmpeg from Libav has been depreciated (within Libav) and has been replaced by avconv from Libav. The "deprecated" message does not apply to the real ffmpeg from FFmpeg which is unaffected and is still under heavy development. Change -s 1280x800 to whatever resolution you like. Click on Stop button when you finish. You'll get the screen recorded/captured in the file. Gnome 3 already seems to have a very simple thing to do record Screencasts - you can assign what shortcut it uses in Keyboard settings. It records the entire screen, and records directly into a webm file (a fairly widely used format) into XDG_VIDEOS_DIR - by default "$HOME/Videos". By default, to start recording, press Ctrl + Alt + Shift + R. You'll see a circle displayed on top right corner to indicate recording is in process. To Stop recording, press Ctrl + Alt + Shift + R again. This is how I did the above animation, with the exception that I added -dither None -colors 80 -fuzz "40%" -layers OptimizeFrame to the convert command*, and cropped the result in GIMP. It turns your key strokes into highly readable subtitles overlaid on the recording. It seems like it would be incredible for tutorial and training type videos about CLI-based topics. Not positive it fits all the original criteria, I will try to update later. This bash script is based on ffmpeg. It calculates the required resolution and record your desktop in high-definition. Change the filename to your taste. This script can be found on github here. Check out Peek. 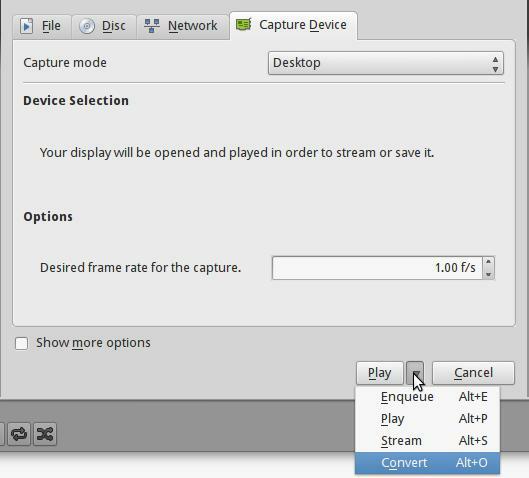 You can record screencast of a selected region and save it as GIF. You can install the latest version of Peek on Ubuntu from its PPA. Kdenlive is a free open-source video editor for GNU/Linux and FreeBSD, which supports DV, AVCHD and HDV editing. Kdenlive relies on several other open source projects, such as FFmpeg, the MLT video framework and Frei0r effects. ScreenStudio is a top notch screen recording software. There are no dependencies beside the need for the JRE 8.0 (OpenJDK). Allows you to select which screen you want to record if there are multiple screens. 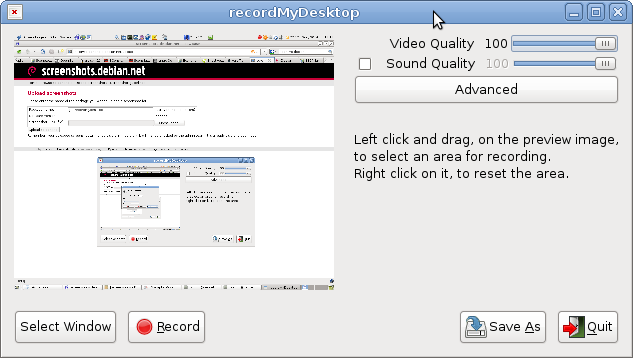 You can chose the desired resolution for recording video from the webcam. Stream directly to YouTube live, Twitch.tv, HitBox and Upstream. Supports FLV, MOV and MP4 formats. If it shows something like this then you have Java 8 installed. Otherwise you need to install it. How can I install OpenJDK on Ubuntu 16.04? Download it. Use Nautilus file explorer to go to the download directory and extract the archive using default archive manager. How to use ScreenStudio features? ScreenStudio is so much rich in features that it can be explained only through video tutorial. I have used Soapbox, which is a great extension developed for Chrome. It records your camera, mic, and screen all together. After you're done recording, you can use their online editor to select during what sequences of the recording you want to show your screen, your camera, or both. Not the answer you're looking for? Browse other questions tagged software-recommendation screencast desktop-recording or ask your own question. What is the best desktop/screen recorder? What are the best Screencasting tools? RecordMyDesktop doesn't work. Suggestions for a screen recorders for my game console? 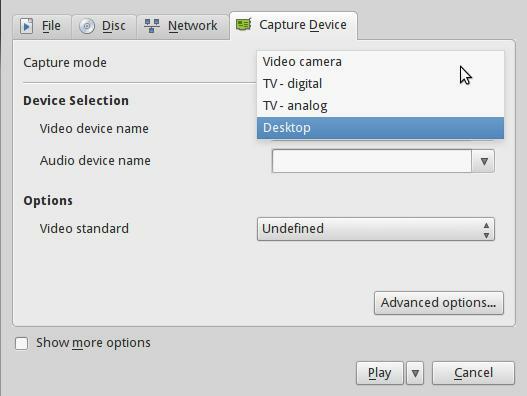 What is the easiest way to record my desktop in Ubuntu? Good screencasting programs for Ubuntu? Can I somehow record my screen with whatever sound is coming from the speakers? How to record desktop in .flv format? How to Record Screen and internal Audio? How to record desktop screen with audio? How can I record the screen as well as audio on Ubuntu?